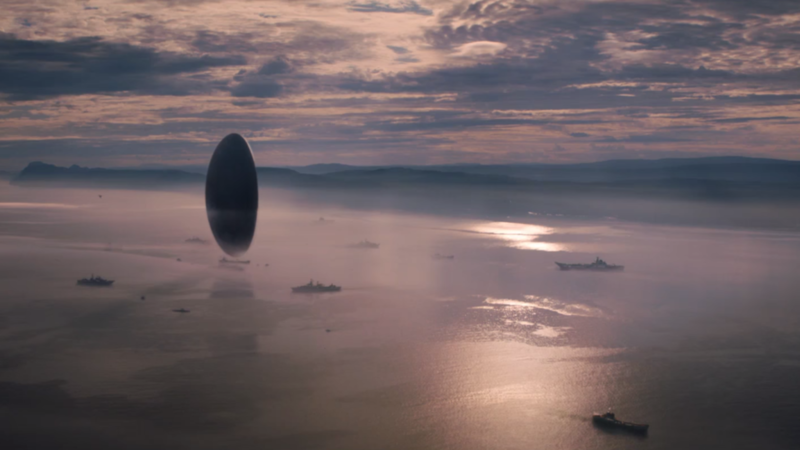 Denis Villeneuve’s stunning new science fiction film, Arrival, begins with the appearance of 12 alien spacecraft on Earth. They land – albeit by actually hovering slightly above the ground in an eerie fashion – in 12 seemingly random points around the world and as governments in each country struggle to decide what to to do, the people begin to react and order seems to break down to some degree. The idea of aliens arriving on Earth is something we are very much used to from science fiction, but the reality would be a lot to take in. Villeneuve and screenwriter Eric Heisserer, who has expertly adapted Ted Chiang’s Story Of Your Life for the screen, are not concerned with the wider world in Arrival – or at least, they don’t appear to be on the surface – and the film is not a blustering behemoth of a blockbuster with rousing presidential speeches and famous landmarks exploding. This is a quiet, personal and highly intelligent film about a first contact. And also, so, so much more. At the centre of this story is a linguist, Dr Louise Banks (Amy Adams), who is tasked with communicating with the aliens that arrive in the US. In order to do this she must work inside the alien craft – the first time we see her enter the craft Villeneuve and cinematographer Bradford Young play an extraordinarily impressive trick with the spatial dynamics – and attempt to find some common linguistic ground. The sticking point, though, is that the written alien language that Louise begins to learn is not expressed or understood in a linear fashion and the aliens, which are referred to as Heptapods due to their seven limbs. think in an atemporal way. Louise is a fiercely intelligent and a highly driven specialist in linguistics, though (the film is a fantastic rallying cry for intellectualism, the beauty and wonder of science and Adam’s character is a thrilling role model) and soon begins to understand the Heptapods’ strange language, which is “written” by them in peculiar, circular Rorschach-esque patterns using ink excreted from their limbs. The Heptapods are eerie, almost Lovecraftian creations that float in a thick fog behind a glass-like wall in front of our protagonists and Villeneuve – aided by a score from composer Jóhann Jóhannsson that adds chills and emotional cues in all the right places – makes the thrill and the dread of first contact feel real and something that we too are going through. Adams is at her career best as Louise, with so many complex emotional and intellectual ideas being expressed in the film it’s extraordinary to watch Adams at the core of these, an anchor in an ever deeper ideas-led narrative as the film progresses. Heisserer’s screenplay is incredibly elegant and a truly remarkable piece of writing that slowly peels back layers as the story develops. The narrative of the Heptapods’ first contact with the human race is told concurrently with the story of Louise’s relationship with her daughter and that daughter’s death. All of this leads towards a reveal regarding the alien language and its affect on Louise that refocuses the entire film and leaves one reflecting on what we have been watching, the false limits of the way in which we think about the world and the very way in which we live our lives. It’s heady and emotional all at once in a way that is so intense that as Max Richter’s “On The Nature Of Daylight” builds in the film’s final moments and the full implications of what has really been going on land, the emotional impact is devastating and elating all at once. A beautiful, emotional and intellectually engaging film, Arrival is science fiction at its best.